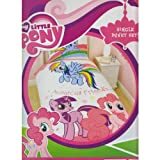 Girls/Kids My Little Pony Design Duvet Set, perfect for your childs bed. Size – Duvet cover: 53 x 79 inches. Pillowcase: 19 x 29 inches (all sizes are approximate). This entry was posted on Sunday, August 4th, 2013 at 4:29 pm	and is filed under Quilts for Kids. You can follow any responses to this entry through the RSS 2.0 feed. You can leave a response, or trackback from your own site.